From Nunam Iqua, sixth grader Kyra Afcan, eighth grader Christopher Johnson, seventh grader Tyler Pete, and sixth grader Isis Canoe head to states this weekend. From Stebbins are Averon Katcheak in grade 7, Karla Henry in grade 8, and Kelly Mike in grade 7. Excelling in previous school and district Yup’ik spelling bees earned these students their tickets to states, and they’ve been prepping the entire school year with their coaches. According to Stebbins Coach Becky Atchak, the bee is especially challenging because most kids today haven’t grown up speaking Yup’ik. Training for the bee involves not only spelling but learning the language and its different nuances: including grammar and guttural sounds that are quite different from the English language. Atchak is passionate about keeping the Yup’ik spelling bee active in Stebbins. She says that even if she were to retire from teaching, she’d still volunteer as coach, a role she’s held for all 8 years that Stebbins has participated in the bee. The statewide bee wouldn’t be possible without its organizer, Freda Dan. Each September, she helps interested schools get started, and after that, she’s in constant communication with coaches, providing detailed lesson plans and other tips to help engage students in Yup’ik language learning first, and spelling second. Dan says she created the bee years ago because she wanted a way for her grade-school-aged kids to connect with the language, having not grown up learning Yup’ik herself. Now that her own kids have aged out of the program, which is for students in third to eighth grade, she says she could’ve stepped away. Dan adds that students who’ve aged out have asked if there’s a Yup’ik bee for high school or if they can get their hands on extra learning material. A parent once told her that her son would read his list of words in bed, the study sheet still in his hands as he drifted off to sleep. Coach Atchak echoes that the bee is about more than just spelling: it’s about language revitalization. The statewide Yup’ik spelling bee kicks off Saturday at 11 am at College Gate Elementary School in Anchorage. In the meantime, Atchak is encouraging her students to study, study, study, every chance they get. Image at top: Shea Matthias from Bering Straits School District competes in the Yup’ik Spelling Bee for Beginners back in 2015. 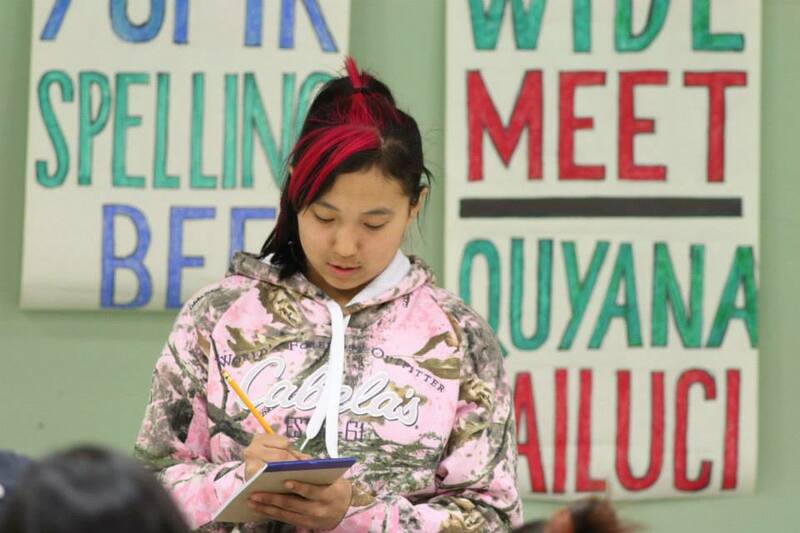 According to organizer Freda Dan, the Yup’ik spelling bee differs from English spelling bees in that students are able to write out their answers before spelling them out loud. Photo: Freda Dan, used with permission.